This guide will show you what to look for so you can proceed with confidence in determining if you have a CSA 11, Type I or a CSA 12, Type II stamp. These two issues are frequently mis-identified. Other designs that are similar in many respects are designs for CSA 9 and CSA 10. See the next essay for a discussion on those issues. Archer & Daly Engravers of Richmond, Virginia created the dies for these designs. Archer produced the die for Type I. John Halpin created the die for Type II. For many years, it was believed that John's Halpin's brother Frederick had engraved these stamps but, in 2015, Halpin descendant Jeffrey Hawkins proved that it was Frederick's brother John (both were engravers) who engraved the stamps. The story of these two brothers was published in The Confederate Philatelist, the journal of the Confederate Stamp Alliance. The publications of August Dietz from 1929 through 1986 had the incorrect information, as does the 2012 CSA Catalog, as the new information had not yet come to light at the time it was published. 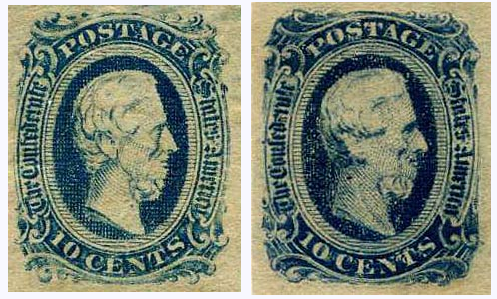 Type I was the design used to create the "Frame Line" 10¢ issue. The frame lines are not inherent in the design. The copper plate used was initially scribed using a straight edge to serve as a guide for placing the individual transfers of the design on the plate creating CSA 10. This same die was reused to create two steel plates, numbered 1 and 2, creating CSA 11. Type II was never used with a copper plate. Type II was also never involved in a plate with scribed lines to assist placement. So, if someone offers you a Frame Line 10¢ CSA stamp of the Type II variety, politely decline. Two plates of the Type II design, plates #3 and #4, also were manufactured. Shave and Haircut ... Two Types! The easiest way to tell the difference in the two types is the hair line on the neck. The hair on Type I extends below the level of the ear. The bottom of the neck hair and the top of the beard align. Type II hair ends on the back of the neck at just about ear level. The bottom of the hair on the neck and and the curve of the lower lip align. If there is hair extending below the ear you have a CSA 11. If the back of the neck is free of hair below the ear you have a CSA 12. Another tonsorial tip-off is the beard. Just below the point of the chin, the Type I beard has a small tuft of beard ending in line with the back of the lips. The Type II beard appears to be a single entity without this tuft. Another distinguishing mark is a small area of die damage to Type I. Sometime, probably during the creation of the the copper Frame Line plate, a small bit of damage was done to the die. This resulted in all subsequent entries showing a distinct colorless vertical dash below the bust above the N of Cents. There is nothing remotely like it on Type II examples. The lettering of the word Confederate differs between Type I and Type II. The Type I die has what appears to be a "U" for an "N" in the word Confederate. Type II has an "N" in this position. The lower left corner of the design ornaments differ in several ways. The lower portion is more open on Type I than it is on Type II. Also, the heavy shading line in the lower ornament is longer and less vertical in Type I than it is in Type II., see the lower highlighted oval in the images below. There is a distinct extra scroll projection on Type II that is not present on Type I. Note the heavy "C" shaped line terminating this extra projection on Type II. See the upper highlighted oval area in the images below. The upper left corner of the design also holds some very good diagnostic material. The elaboration of the corner ornaments on Type I is very restrained in comparison to the Type II examples. Some copies of Type II show a faint line that totally encircles the design while conforming to the outer contours of it. This is a feature that does not appear on every stamp from Type II. It is never present on Type I. This is not pictured. We hope this explanation of the differences between Type I and Type II has been helpful to you. A March 2007 Mail Bid sale had the stamp pictured at left with the following description. "12 VF, OG, sm flts, Privately Perforated 14x14". Genuine perforated stamps are "officially perforated" 12 1/2. There are several unofficially (private) perforated issues as well, but they don't look like this. They are generally very crude and range from "sewing machine perfs" to "sawtooth" design. There will be another "Trouble Spots" section eventually to deal with this sticky subject. If you are not an expert in this area, it is wise to buy with the option to get the stamp expertized.